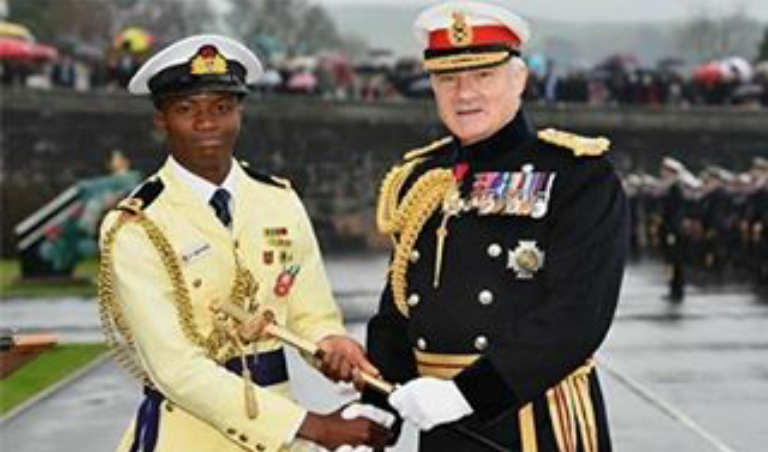 UK decorates Nigerian Naval officer with sword of honour. As Stated by Instablog9ja, Sub Lieutenant (SLt) Abdulrahman Buniyamin has been honoured in the U.K for exhibiting rare enthusiasm and commitment to his training while at the Britannia Royal Naval College (BRNC), between February and October 2015. He was presented with a ceremonial sword by General Sir Gordon Messenger, Royal Marines, Vice Chief of the Defence Staff during the final passing-out-parade held at BRNC on 16 December 2016. The sword is sponsored by the Britannia Association, the College Alumni, and also recognises the Cadet who improved the most during training. During his time at the world-renowned College SLt Buniyamin achieved a Royal Yacht Association Powerboat Level 2 qualification and became known as the first to volunteer for any extra task.